Nautical Chart depicting Alabama's Mobile Bay. H No. 10 Preliminary Sketch of Mobile Bay. 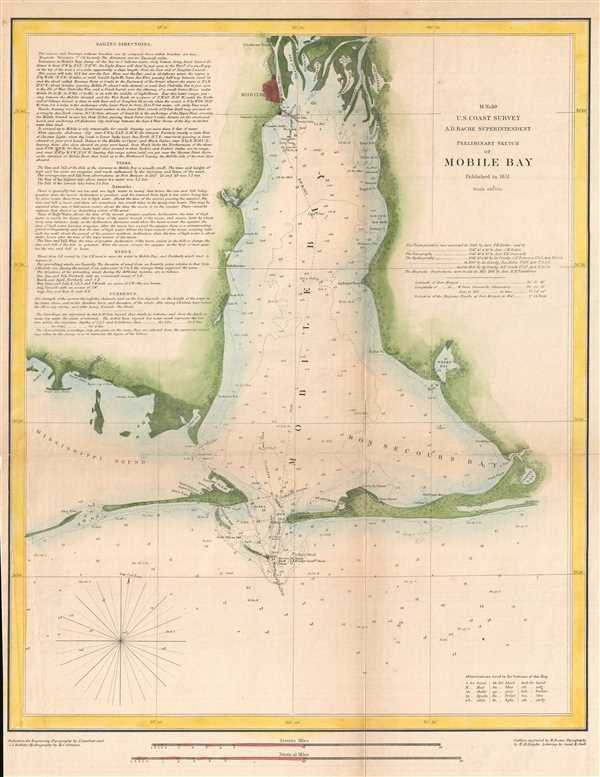 This is an uncommon 1851 U.S. Coast Survey Chart or Map of Mobile Bay, Alabama. The map depicts the region from Grand Bay and the mouths of the Alabama and Apalachee Rivers south to Mobile Point, Dauphine Island, and the Sand Island Bank and extends westward into the Mississippi Sound to roughly 18 degrees west longitude from Washington D.C. The city of Moblie, Alabama is illustrated, along with excellent detail of the nearby river delta. Countless depth soundings are included throughout. Notes on tides, under sea dangers, and sailing instructions are situated in the upper right corner. The entire chart was prepared under the supervision of A.D. Bache, one of the most influential and prolific figures in the early history of the U.S. Coast Survey. The chart was engraved by H. Evans, H.M. Knight, and Samuel E. Stull and published in the 1851 edition of the Report of the Superintendent of the United States Coast Survey. Very good. Toning along original fold lines. Professionally flattened and backed with archival tissue. Blank on verso.